The trailerable cruiser CP 23 Pilothouse offers a revolutionary combination of trailerability, cruisability, and livability. 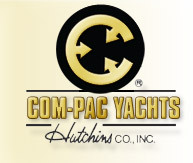 Com-Pac Yachts began business in 1974 with our first boat, the Com-Pac 16. The idea then was to build a seaworthy yacht with a strong commitment to value. (For the full story, see Hutchins Company Profile.) Since then we have expanded our line and today we have twelve models, six cat-rigged sailboats, five sloop rigged sailboats and one power launch. 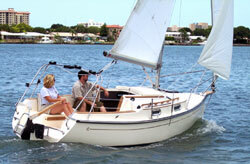 The Com-Pac line covers a wide range of sizes from a 14' day sailor to the Com-Pac 27/3 cruising yacht. Each model, regardless of size, is built with the same exacting attention to detail and that same commitment to value. The Launch is a comfortable, multiuse yacht for a leisurely cruise for sightseeing, to dinner or, even, the occasional overnighter. The sloop-rigged Com-Pac Eclipse, designed for ease of trailering, has a shallow 18" draft (with board up), and a clutter-free transom for easy boarding. Our line of modern cat-rigged models (dubbed “A New Breed of Catboat”) offer the ultimate in trailer-sailing ease and rig set up. All come with the Mastendr™ quick-rig sailing system that allows for the boom, sail, and gaff to be left installed on the boat while the mast is folded or raised. 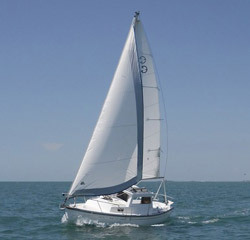 The shrouds stay attached and the head stay disconnects with the flip of the pre-adjusted forestay self-locking lever. This system, unique to Com-Pac, adds an ease and convenience to trailer sailing that is really astounding. Your mast is up and you are ready to go in seconds, not minutes. 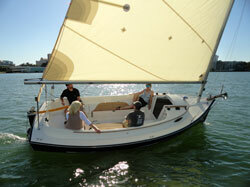 Our newest sloop-rigged models are the Eclipse SL and the Legacy. We consider these yachts “crossover” models. We have taken all of the convenience and features of our cat boat line and applied them to these new exciting sloops. Features include the Mastendr™ (Eclipse), Boomtendr™ (Legacy), keel centerboard hull configuration and low riding trailers for ease of launching and retrieval. The three traditionally rigged sloops (23/IV, 23 Pilothouse, and 27/3) have full masthead, eight stay rigs and fixed keels. As such they can be sailed in areas and conditions that lesser sloops would be wise to avoid. Many of our sloops have long cruises to their credit. Coastal cruising, Gulf of Mexico crossings, and long term Bahamas cruises are a few that are recorded. 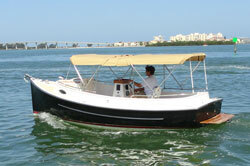 The 23/IV and 23 Pilothouse are trailerable but they are still full fledged cruising yachts. We did not compromise sea-worthiness or comfort. When the 23/IV or 23 Pilothouse is fitted with the available custom trailer, they can easily be taken over the road for vacation or winter storage. The new launch with the available electric propulsion is perfect for an evening of touring the harbor, canals and waterways or even more varied areas of interest with the standard 2 cylinder diesel engine. All of our models come with an extraordinary list of amenities and standard equipment. From the 14' Picnic Cat to the 27' cruiser, you will find everything you need for that day sail, day cruise, weekend getaway or extended cruise.